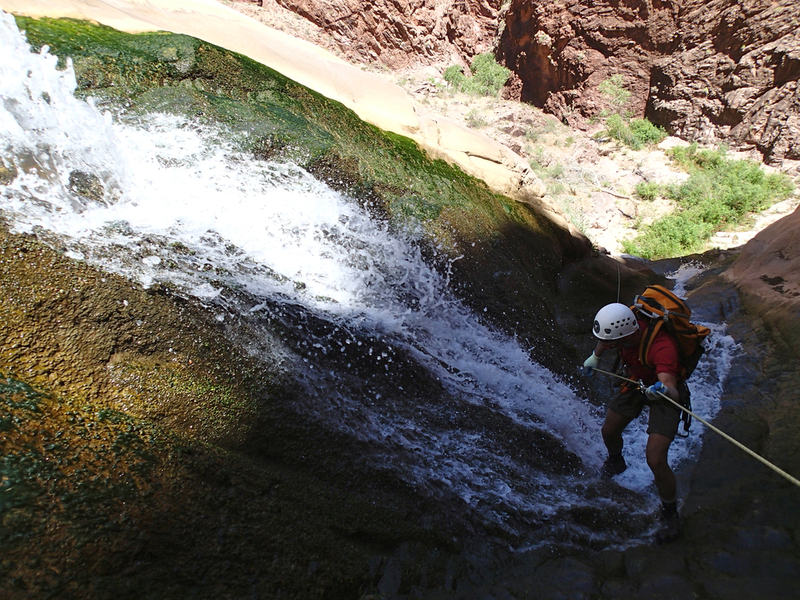 Garden Creek Canyon is located in the Grand Canyon National Park just off the Bright Angel Trail. 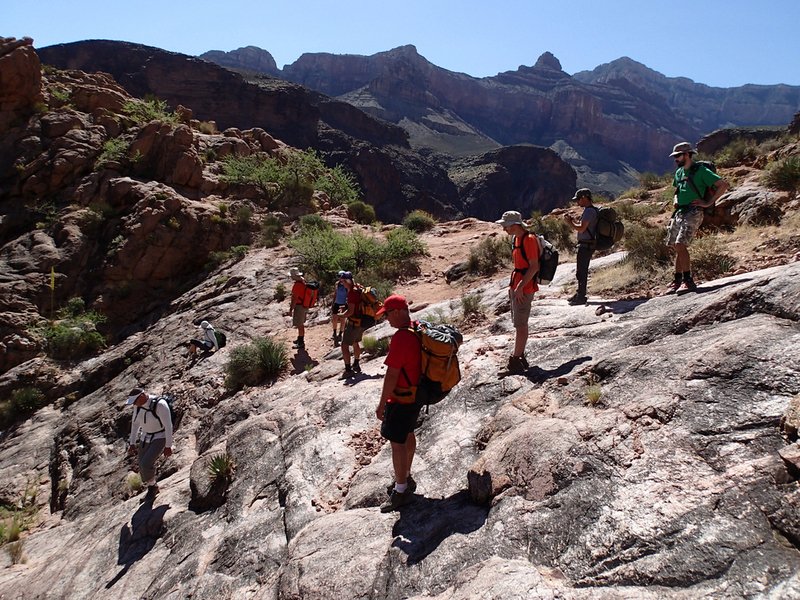 Our trip started on a Friday night where we all met up and camped at the Mather campground on the south rim and eventually began our hike down the Bright Angel Trail. We were able to get camping permits to stay at the Indian Garden Campground which allowed us to take our time knowing we had a place below to set up base camp. It took our group just shy of 2 hours to make it to camp, where we were able to drop any and all overnight gear before gathering our technical gear and heading down the trail to the drop in point. 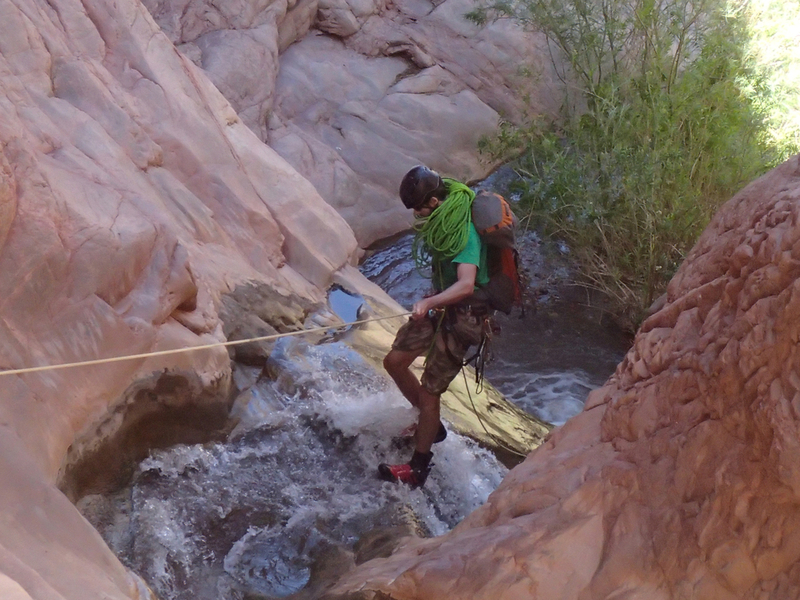 Our group had (3) 200' ropes, approximately 50' of webbing, and the standard gear one always brings in the canyon. 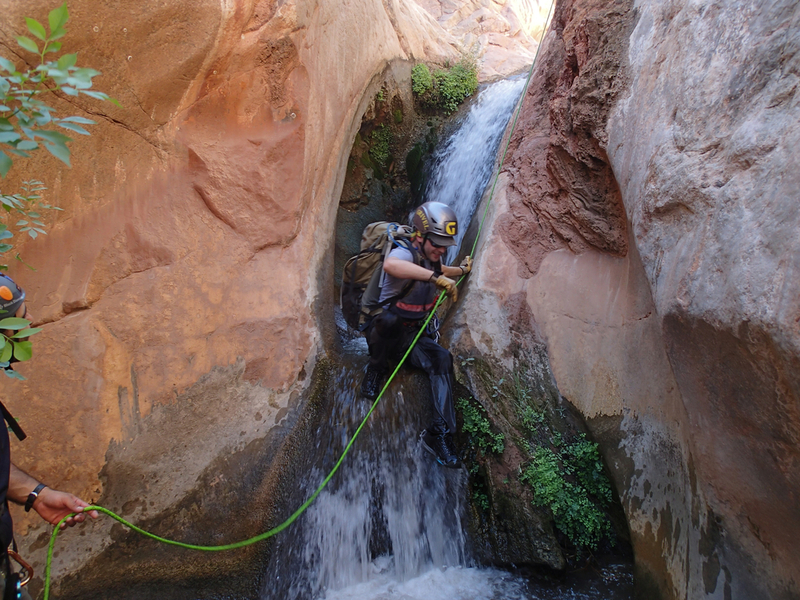 Once geared up at the drop in, Garden Creek gets technical and commits you to completion fairly quickly with some nuisance rappels and a couple down climbs. We were surprised to find that this canyon has been bolted with chain hangars throughout the route, and although natural anchors are always preferred, I could not help but notice that the bolts were very nice quality Fixe chained hangars that appeared to be placed professionally and in good locations (if they get removed, time will only tell! If they do get removed, I sure hope they do it without doing more damage than just leaving the hangars, I have seen some crappy patch jobs for the sake of bolt removal). Water temperature was perfect on this day and the few pools of wading was never really deeper than about waist high, but wet suits should be considered based on personal preference. 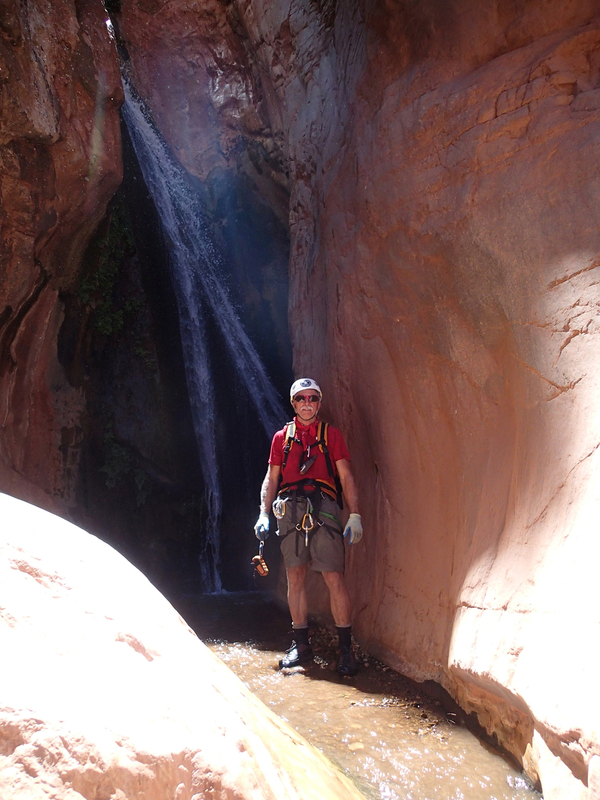 Once through the technical section, Garden Creek Canyon dumped us out out back on the Bright Angel Trail just below the section known as the Devils Corkscrew. From here it was time to pay the canyon for the ride with a uphill battle to re-gain the elevation just lost. 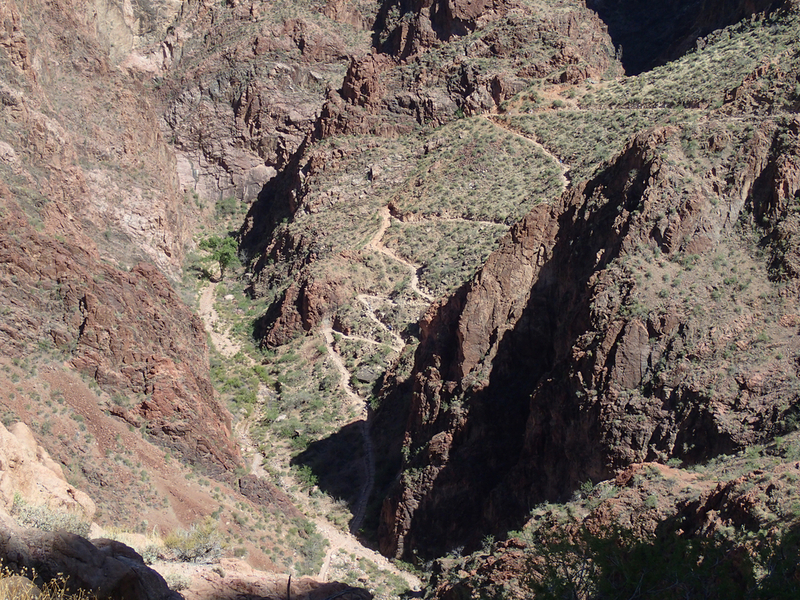 When we arrived back at the drop in point the hard part was over, from here back to Indian Garden was a fairly straight forward slightly uphill hike back to camp. Once we had time to unwind, a few of us hiked up to Plateau Point for a view of the Colorado River, when we noticed that from that vantage point you could see a birds eye view of the canyon we had just descended along with the tail end of the long sweeping waterfall where we ate lunch (highly recommended short hike). The next day we broke camp at sun rise and began to make our way to the rim and back to our vehicles. 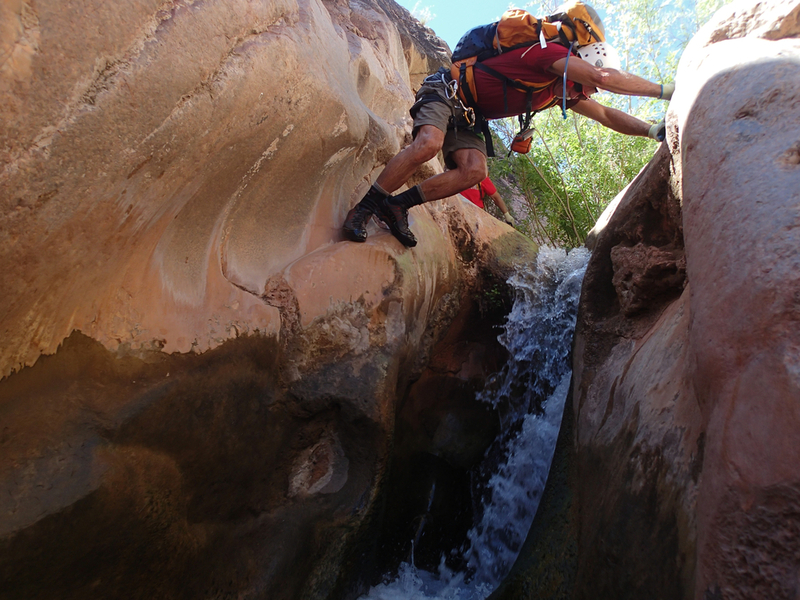 This canyon can be done in a single day as a down and back, but if given the opportunity I would recommend obtaining a permit to camp and unwind for the night at the Indian Garden Camp Site.